The organization’s premiere event had a number of factors working in its favor. First, it could reference an in-depth emergency preparedness plan, first drafted in 2007. This outlined the procedures staff would take in response to everything from bomb threats to medical emergencies. Second, CUPA-HR could count on highly educated members. Their jobs already required them to be well-versed about pandemics and deeply involved in helping to plan and manage H1N1 response on their own campuses. The 1,100 professionals who attended the annual meeting would not need hand-holding. Third, the conference, at two-and-a-half days, was relatively short in duration. Hayden believed most people would likely come and go before showing symptoms of “swine flu.” Her bigger concern, because they would be on site for a longer period of time, was keeping her staff healthy. What emerged was a four-point plan. Step 2: Cancellation. Individuals who wish to cancel their registration for any reason are routinely required to notify CUPA-HR in writing. When a couple of cases of swine flu actually surfaced, those requests were immediately honored. Step 3: Prevention. The organization decided early on to make sanitizers available just about everywhere. 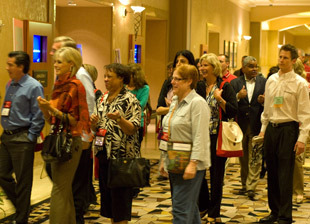 Attendees appreciated seeing them at registration, in CUPA-HR’s booth, at stations around the exhibit hall (where breakfast, opening reception and break functions took place) and outside banquet rooms. Step 4: Contingencies. Hayden and the CUPA-HR team were ready to assist attendees who contracted any form of the flu. They compiled information about local medical facilities and recruited volunteers with private vehicles on site should someone need transportation. They enhanced their “safety kit” to include disposable thermometers and fever-reducing medicines.